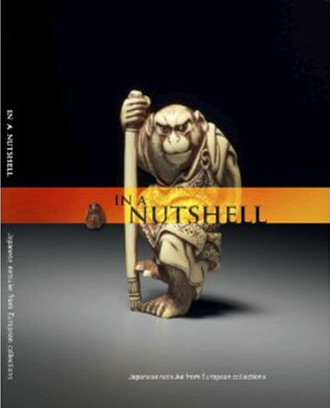 The book describes more than 100 Netsuke, Inro and Tobacco implements (360º pictures showing every side of the pieces). Size: 235 x 325 mm. Full color printing. Each volume consisting of approximately 350 pages. Richly illustrated with over 500 color plates. The text is both in English and French, with some Japanese annotations. Two volumes in a slipcase. Reduced Price! $155 USD / 120 €. A book exploring Netsuke - the small carved toggles used to fasten a man’s sash, an integral part of Japanese costume. Today netsuke are considered an art form in their own right and are prized by collectors around the world. They are found in a variety of forms and depict a wide range of subjects – including figures of human and legendary form, ghosts, animals, botanical subjects and masks. Skillfully worked, these miniature carvings are of great artistic value, but they also provide a window into Japanese culture and society. This book brings together one hundred of the most beautiful and interesting netsuke from the extensive collection of the British Museum, each of which has its own special charm and story to tell. Uncovering the stories behind these netsuke and coupling them with stunning new photography, this book reveals why these tiny objects have captivated so many, the meaning they have held for those who wore them, and what they can tell us about Japanese everyday life. INS Regular Members receive 10% Off! Please contact memberships@netsuke.org to receive your discount code. with French fold laminated dust jacket. A fully illustrated catalogue to accompany the loan exhibition of netsuke at the Embassy of Japan in London (April 4-May 31 2013). Many of the netsuke have not previously been shown in public and show the rich diversity of netsuke gathered by European collectors. This exhibition is being held in conjunction with the INS Convention being held in London May 10-14 2013. 114 pages. All income is for the International Netsuke Society! Renowned netsuke collector Richard R. Silverman's gift of 226 ceramic netsuke to the Toledo Museum of Art constitutes perhaps the largest public collection of these miniature clay sculptures in the world. Adornment in Clay provides new scholarship and an in-depth examination of this subgenre in the context of both Japanese ceramics and the wider field of netsuke production. 8 1/2 x 8 1/2 inches, color images throughout. Contents: Foreword (Carolyn M. Putney); Introduction (Neil Davey); Collecting Ceramic Netsuke: My Personal Journey (Richard R. Silverman); A History of Ceramic Netsuke; Selected Highlights; Map of Kiln Locations; Illustrated Checklist of 226 Netsuke plus Seals and Signatures; Glossary; Selected Bibliography; Index. Ichiro: Master Netsuke Carver features more than 150 netsuke by a single artist, one of the largest single-artist netsuke collections in the world. 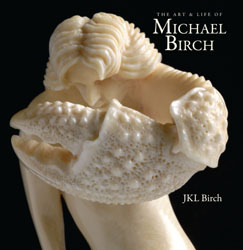 In addition to the Shelton Collection, the book features netsuke from the collections of Robert O. and Miriam Kinsey and Richard R. Silverman. Drawing from numerous individual collections, this catalog was published to coincide with the exhibition of netsuke, inro and sagemono at the Morikami Museum in conjunction with the 2007 International Netsuke Society Convention. The pieces displayed here are among the finest examples in private hands and certainly rival those of the world’s major museum collections. Included are over 50 netsuke, 39 inro with netsuke, and nearly 20 other sagemono. Each piece is given a brief description with insights into the artists and subject matter. This catalog provides a rare opportunity to see some of these incredible works of art never seen or seldom shown before. 94 netsuke, 2 sceptres and 48 ojime, illustrated in colour, often from several angles, and discussed at length by the three authors. 215 pages. Published by Sydney L. Moss Ltd., London, in 2006. £65 or US $120 plus postage. Exquisite color photography and scholarly insights bring alive this amazing tradition. 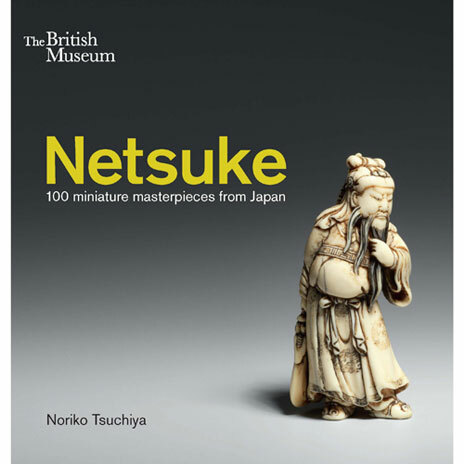 It features more than 820 netsuke, with accompanying text that gives a complete overview of changing tastes in netsuke collecting and carving throughout its history and into the present day. Each netsuke has a detailed description that places the subject in the context of Japanese life and history, and gives important information about the carver or technique. The enormous variety of netsuke subjects are thoroughly examined, including famous battles and samurai, kabuki and noh actors and plays, scandalous stories, animals and imaginary creatures, Buddhist sages, and Shinto rituals. This volume presents netsuke from the collection of the two leading netsuke collectors: Anne and Christian Trumpf, now in the Linden Museum, Stuttgart. Volume I, available as a stand-alone volume, illustrates a selection of 112 masterpieces in full color with text in both English and German. Volume II, not available unless purchase as a two-volume set, contains a complete inventory of over 850 pieces illustrated in black and white with text only in German language. Robert S. Huthart's collection of Iwami netsuke, the largest anywhere in the world, includes more than 360 examples and is particularly rich in signed pieces by five most famous Iwami carvers: Tomiharu (the founder of Iwami style), his daughter Bunsho, her nephew Gansui, the independent artist Kanman, and Goho, who was active in the neighboring province of Aki. The catalogue includes at least one color reproduction of each piece alongside a detailed description and information about subject-matter and provenance. Catalogue of Japanese netsuke in the collection of the Toledo Museum of Art, including the early holdings of Noah H. Swayne and Harry Fee, and the recent donation by Richard R. Silverman, one of the most important collectors of netsuke. The collection features many rare pieces, including a rare glass netsuke and early 19th century netsuke of a warrior wearing a helmet. This volume published in 2000 is a complete catalogue of the collection of inro and netsuke in the Tokyo National Museum. The collection contains 108 inro and 565 netsuke, including 272 pieces from the Go collection. Both inro and netsuke in the collection are of extremely fine quality because they were collected early and include many national treasures. Each piece is illustrated with the artist's signature where available. The hardcover book contains 250 pages, 16 color plates, and 675 items illustrated in black and white. Text in Japanese with an introduction and list of plates in English. Neil K. Davey provides detailed descriptions for this easy to use, interactive, reference CD-ROM. The Cohen Collection features 305 works of art, including 57 netsuke, 62 inro and lacquer boxes with 645 color photographs, including close-ups of signatures and seals. Divided into categories, an effective search facility and a slide show feature. Selected descriptions or photographs can be copied to the user's PC or printed out. Selected largely from private collections, based around a core of works from a private Dutch collection, the survey of 84 fine and remarkably varied netsuke ranges from several strong and important early animals and figures, some of them dating from the early and mid eighteenth centuries, to superfine and fascinating later works of the late nineteenth and early twentieth centuries. The color, hardback catalogue is 204 pages long with 283 photos(several of each netsuke). Cost is £65 or $100 US with postage and packing as follows: UK £5, Europe £6.50, USA £13.50 or $21.50 US, Far East/ Australia £14.50 or $23 US. Surface mail to all destinations is £6 or $9.50 US. Please contact Sydney Moss, Ltd. for further information. Telephone 020-7629 4670 or facsimile 020-7491 9278. Catalogue from the 1998 netsuke exhibition at the Minneapolis Institute of Arts, text by Matthew Welch and Sharen Chappell. An Annotated Guide to Miniature Japanese Carvings by Norman L. Sandfield. Buy it on Amazon Buy it at Paragon! Sagemonoya Gallery 1998 catalogue consisting of 175 items, 55 Sagemono and 120 Netsuke. The catalogue is available for US $30, postage paid. Sagemonoya Gallery So School catalogue consisting of 99 So School Netsuke. The catalogue is available for US $50, postage paid. Eskenazi 1998 sales catalogue of Japanese netsuke, ojime and inro from a private European collection. The catalogue for the April - May 1998 exhibition of netsuke and sagemono at the Toyama Museum, Toyama, Japan. The text is in Japanese, with captions in English and Japanese. All 377 items in the exhibition are illustrated in color.